Meiji Boom Arm Systems offer the greatest flexibility in specimen size, and also allow the microscope to be swung into and out of position easily. A variety of configurations are available for extended working distance. Each configured system comes with a Meiji EMZ-13 binocular or trinocular Zoom head. Each configured system is complete and includes boom stand, zoom microscope with 10x super wide field eyepiece and a magnification range of 7x - 70x. Dual arm fiber optic or annular light sources are also available. 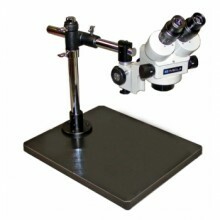 This system includes EMZ-13 with 10x eyepieces with FX holder on a Wide Surface Universal Stand (pictured below). Special wide surface stand with pillar, cross arm and mounting post mounted directly over a large, flat laminate work surface measuring 15-3/4 x 18-7/8 inches. Provides flexible horizontal and vertical movement for large specimens or extended working distances. 20mm diameter mounting post accepts F, FX or FC focusing holders. Vertical pole height: 360mm. Horizontal: 330mm. Focus holder with integral, adjustable illuminator port. Rack and pinion mount allows smooth, precise focusing over 55mm of travel. Coarse focus mechanism incorporates a slip clutch and tension adjustment. Fits 20mm diameter, 71mm long mounting post. The 84.2mm diameter opening accepts all EM Series stereo bodies. Click the button below to add the Meiji EMZ-13 on Wide Surface Universal Stand Microscope to your wish list.